The Elders have urged the governments of 31 countries to do more in the face of mass atrocities, by signing a UN Code of Conduct committing them not to obstruct credible Security Council resolutions designed to halt or prevent these acts. The Elders have urged the governments of 31 countries, including Brazil, India and South Africa, to sign a UN Code of Conduct initiative committing them not to obstruct credible Security Council resolutions designed to halt or prevent mass atrocities. The Code of Conduct was launched by the Accountability, Coherence and Transparency (ACT) group of countries in October 2015 in response to the Security Council’s failure to take action in Syria, and it has now been signed by nearly two-thirds of UN member states. The Elders believe that recent events in Syria underscore the need for concerted action to prevent mass atrocities including chemical weapons attacks. In letters to the foreign ministers of the 31 countries, The Elders emphasised the need for all UN member states to take a proactive role in preventing mass atrocities, and strongly endorsed the ACT Code of Conduct as a means of holding the Security Council to account. “As Elders, we have watched with horror at the current failure of the international community to halt brutal conflicts from Syria to Yemen and South Sudan, situations where mass atrocities have increasingly been embraced as a weapon of war designed to terrorise and devastate entire communities. On too many occasions the UN Security Council has stood by and failed to take effective action, hampered by divisions on the Council and the regrettable use of their veto power by certain permanent members. In the light of these failures, we believe that it is necessary for the wider UN membership to stand up and call on the Security Council to live up to its responsibilities under the Charter to maintain peace and security”. The letters were sent to the foreign ministers of Antigua and Barbuda, Armenia, Bahamas, Bangladesh, Barbados, Bosnia and Herzegovina, Brazil, Brunei, Cambodia, Dominica, Dominican Republic, Ethiopia, Fiji, Gambia, Guyana, India, Marshall Islands, Micronesia, Mozambique, Nauru, Nepal, Rwanda, Saint Lucia, Saint Vincent and the Grenadines, Senegal, Sierra Leone, Solomon Islands, South Africa, Suriname, Vietnam and Zambia. These are all countries who have not yet signed the ACT Code of Conduct. Former UN Secretary-General, Nobel Peace Laureate and Chair of The Elders (2013-2018); put development, human rights, the rule of law, good governance and peace at the top of the United Nations agenda. Expressing deep alarm at the prospect of a further escalation of the Syrian war following the latest reported chemical weapons attack, The Elders call on all parties to avoid further military action. 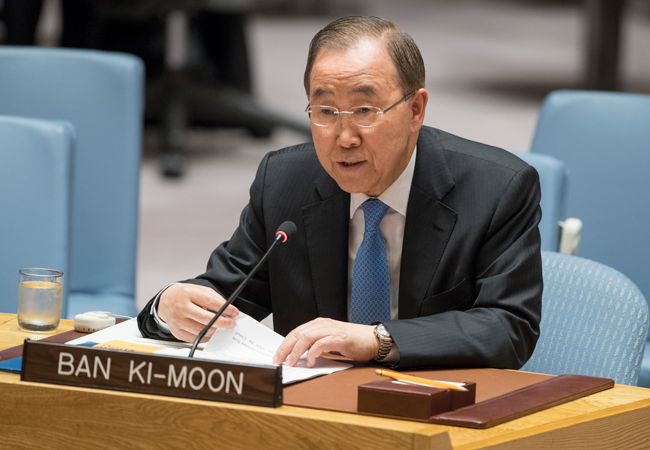 Addressing the UN Security Council on 21 February, Ban Ki-moon called on members to swap rhetoric for action to ensure it delivers on its mandate to maintain international peace and security. "When the Security Council fails, the United Nations fails"
Sign up to receive monthly newsletters from The Elders. We will occasionally send you other special updates and news, but we'll never share your email address with third parties.